After graduating from Crystal City High School in 1927, Joe attended Texas A&M, 40 miles from Gause, but left school to pursue a career in professional baseball.6 On the Coleman Bobcats of the Class D West Texas League, he batted .293 in 1928 and .352 in 1929. Moore was a left-handed batter and right-handed thrower. He stood 5-feet-11 and weighed barely 150 pounds. He was, by all accounts, a skinny, awkward-looking kid. McGraw sent him to the minors, believing he was not major-league material. But Moore hit .335 for three minor-league teams in 1931 and 1932 and could not be ignored. 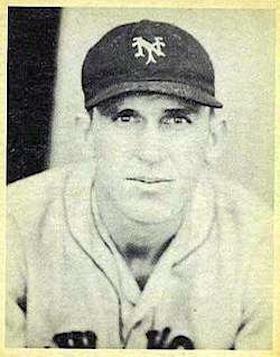 After McGraw was replaced by Bill Terry as manager of the Giants in June 1932, Moore returned to the Giants. Terry saw his potential and installed him as the starting left fielder. In 86 games for the 1932 Giants, Moore batted .305 and made only three errors in the outfield. He hit his first major-league home run off Glenn Spencer of the Pittsburgh Pirates on July 27, 1932. On September 7 he clouted his second home run and went 5-for-5 facing Red Lucas of the Cincinnati Reds. Tutored by teammate Lefty O’Doul, Moore revamped his hitting approach in 1934 by adopting an open stance and learning to pull the ball with power.16 The results were dramatic. He went from no home runs and 21 extra-base hits in 1933 to 15 home runs and 56 extra-base hits in 1934. His home runs included a pinch-hit grand slam off Ray Benge on July 5, 1934; two round-trippers on July 13 against the Pirates; and a game-winning three-run homer off the Cardinals’ Paul Dean on August 23. Moore was named a National League All-Star for the first time. He batted a career-high .331 in 1934 and was third in the National League MVP voting behind Dizzy Dean and Paul Waner. In 1936 Moore batted .316 and had career highs in runs (110) and hits (205). His 25 outfield assists were also a career high and ranked second in the major leagues. The Giants won the 1936 pennant but lost to the New York Yankees in six games in the World Series. Moore collected only one hit in the first three games of the Series, and the Yankees’ defense was to blame. In Game Two Joe DiMaggio made a remarkable shoestring catch of his line drive to center field, and in Game Three he was robbed twice, by right fielder George Selkirk and second baseman Tony Lazzeri.22 As payback to DiMaggio, Moore snared his line drive to left field in Game Three, close to “the bleacher wall near the foul line.”23 Moore went 5-for-13 at the plate in Games Four through Six, with two doubles and a homer. On July 13, 1937, Moore went 5-for-6 with four RBIs and knocked in the winning run in the Giants’ 11-10 victory over the Phillies in Philadelphia. He had a 20-game hitting streak from September 8 to 27, and on September 23 in Chicago, he went 5-for-6 as the Giants nipped the Cubs, 8-7. He helped the Giants win the 1937 pennant, but they lost once again to the Yankees in the World Series. Moore led all players in the Series in hits, going 9-for-23 (.391), including 5-for-9 facing Yankees pitcher Lefty Gomez. Although Moore was a left-handed hitter, he was comfortable batting against southpaws. During the offseason Moore stayed fit working his 550-acre cattle ranch and farm near Gause, where he grew alfalfa, cotton, corn, and hay.27 He was well liked in the community, “an unaffected, genial Texan despite stardom in the majors.”28 Gause schools and businesses closed on April 5, 1938, so that residents could see him play in an exhibition game at Texas A&M between the Giants and the Cleveland Indians. Moore began the 1939 season in a prolonged slump, batting .218 through games of June 3. He broke out of it by going 7-for-14 in a three-game series against the Reds in New York June 4-6. In the third game of the series, the Giants slugged seven home runs, including two by Moore, in a 17-3 rout. Moore’s homers were “well tagged into the upper deck of the right field stands.”31 On August 13 he homered twice in the Giants’ doubleheader sweep of the Phillies. But it was a disappointing season overall for Moore. Although he struck out only 17 times in 612 plate appearances, his .269 batting average was a career low. It was disappointing year for the Giants, too, who finished in fifth place, 18½ games behind the first-place Reds. In 1940 Moore got off to a fast start, batting .355 through games of June 15, but his average declined to .276 by season end, as the Giants dropped to sixth place in the NL standings. The next year, his last in the majors, he batted .273. Moore was inducted into the Texas Baseball Hall of Fame in 1989. On April 1, 2001, he died in Bryan, Texas, at the age of 92. He was buried at the Gause Cemetery. 1 Brooklyn Daily Eagle, September 8, 1937. 2 Uniontown (Pennsylvania) Evening Standard, June 23, 1934. 3 Pittston (Pennsylvania) Gazette, March 23, 1935; Ancestry.com; Findagrave.com. 4 1910, 1920, and 1930 US Censuses. 5 Vivian Elizabeth Smyrl, “Gause, TX,” Handbook of Texas Online (tshaonline.org/handbook/online/articles/hlg10), accessed January 25, 2016. Uploaded on June 15, 2010. Published by the Texas State Historical Association. 6 The Sporting News, December 27, 1934. 7 The Sporting News, July 31, 1930. 8 Brooklyn Daily Eagle, September 24, 1930. 9 The Sporting News, December 27, 1934. 10 Walter M. Langford, Legends of Baseball: An Oral History of the Game’s Golden Age (South Bend, Indiana: Diamond Communications, 1987), 114-115. 11 Cincinnati Enquirer, September 10-11, 1933. 12 Scranton (Pennsylvania) Republican, September 29, 1933. 13 Hagerstown (Maryland) Daily Mail, October 2, 1933. 14 Shamokin (Pennsylvania) News-Dispatch, October 9, 1933. 15 Baseball Digest, March 1990. 16 Langford, 109; Altoona (Pennsylvania) Tribune, June 19, 1935. 17 Brooklyn Daily Eagle, April 7, 1937. 18 Baseball Digest, March 1990. 19 Brooklyn Daily Eagle, May 22, 1935. 20 The Sporting News, July 18, 1935. 21 Cincinnati Enquirer, August 20, 1935. 22 Santa Cruz (California) Evening News, October 9, 1936; Reading (Pennsylvania) Eagle, October 4, 1936. 23 St. Louis Post-Dispatch, October 3, 1936. 25 Bill Johnson, “Hank Aaron,” SABR Biography Project. 26 Pittsburgh Post-Gazette, May 8, 2001. 27 Santa Cruz Sentinel, May 21, 1939. 28 Bryan (Texas) Eagle, March 29, 1938. 29 Brooklyn Daily Eagle, August 1, 1938. 30 Hearne (Texas) Democrat, November 18, 1938. 31 Cincinnati Enquirer, June 7, 1939. 32 Pittsburgh Post-Gazette, September 4, 1948. 33 Bryan Eagle, May 30, 1947. 34 Bryan Eagle, June 23, 1960. 35 Hearne Democrat, June 29, 1962.